just emailed me these pictures of her home. I pulled up the first one and thought that she accidentally sent me a picture from Country Livings website. But oh no, she lives here. She is LUCKY enough to live here. And they did this all themselves!!! I am speechless, really, and that doesn't happen too often! Why in the world doesn't my house look like that?! I want those amazing shelves in her dining room. 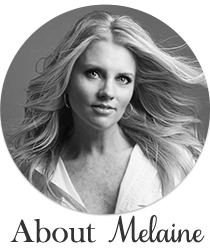 Melaine, I can't thank you enough for yet another post on our home. I'm truly honored to be featured on your blog, thank you so much! I was looking at her website a couple of days ago in awe. It is amazing and every detail is perfect. Can I move in? I love how bright and welcoming her home shows. If only mine could grow up to look the same! It is just wonderful, I want her to come to my house for a month or two!! her house is amazing. it's hard to believe that people can actually do that. WOW!! No stinking joke! It's amazingly beautiful - every last detail. This is a beautiful room. How did she do the shelves along the wall? Please, please tell us! I adore that giant mirror!